http://berriencountyga.com/http://berriencountyga.com/A previous post about Jamie Connell mentioned his work as Public Relations Officer at Moody Air Force Base near Ray City, GA (see Jamie Connell worked at Moody AFB.) Jamie Connell’s life of service had a broad foundation. 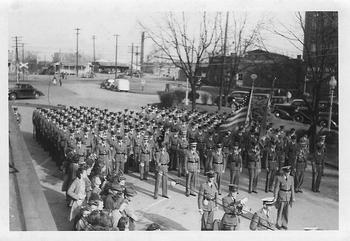 Jamie Connell prepared for his future career first by attending the preparatory school at Gordon Military Institute, Barnesville, GA.
Gordon Military Institute cadets on parade in 1941. 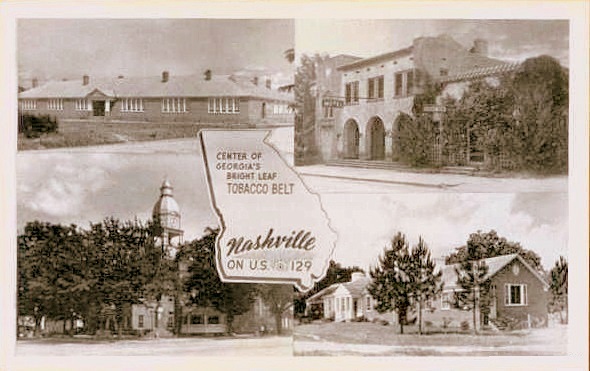 Founded as Male and Female Seminary in 1852, this was a pioneer school of its kind in Georgia. It was reorganized in 1872 as Gordon Institute, named for General John B. Gordon, famed Confederate soldier… In 1927 this school became Gordon Military College, an Honor Military School, an accredited, non-sectarian, five year preparatory Junior College. North Georgia College was originally organized and administered on a military basis which system has prevailed from the date of its founding. The college has been classified by the United States Government as an “essentially military college,” being one of eight colleges in the United States so designated. It is the only one in Georgia, and, since “essentially military colleges” endeavor to emulate the traditions of West Point, North Georgia College has well been called “Georgia’s “West Point.” General Robert Lee Bullard, formerly Commandant of Cadets and Professor of Military Science and Tactics, referred to the college as one of the two finest military schools in the country. 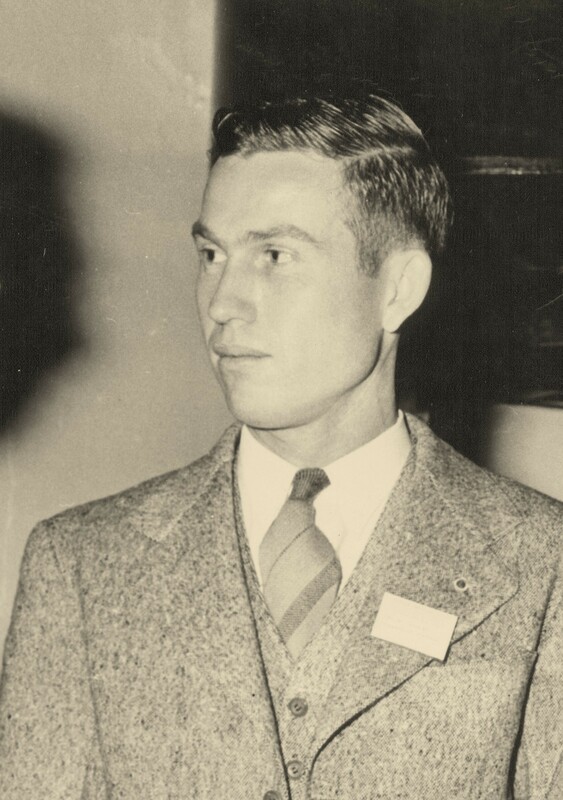 Jamie Connell, Cadet, North Georgia College, 1940. At North Georgia College, Cadet Sergent Connell was a member of the Camera Club, served on the staff of the Cyclops college annual, and was editor of the Cadet Bugler, college newspaper. As a North Georgia College Cadet, Jamie Connel was practicing for a future career in the military and public relations. In 1940, he shared some of his experiences as Editor of the Cadet Bugler with The Atlanta Constitution. From the North Georgia College has come a letter. It was written by Jamie Connell, editor of The Cadet Bugler, campus publication. It is about the German propaganda that has flooded into his office, at the school, ever since the beginning of the 1939-40 school year. Some of the material, writes Connell, is far-fetched and horrible, like the alleged atrocities told in that pamphlet, already described in The Constitution, “Polish Acts of Atrocity Against the German Minority in Poland.” Other is more like the sugar-coated pills you swallow without leaving a bad taste in your mouth. Pamphlets attempting to justify the Nazi policy and emphasizing the cultural, moral, and economic nature of the German people. A large portion of this stuff is sent out bu the German Library of Information, 17 Battery Place, New York. With it they send booklets of German carols and christmas toys for children. More sugar coating. There are other propagandists who, deliberately or otherwise, are almost as great a menace and nuisance. There is for instance, the Committee on Militarism in Education. That organization can protest so speciously against innocent facts that they become ridiculous. There is the American Committee for Democracy and Intellectual Freedom, the Youth Committee Against War. And others. They all send their stuff to newspaper offices and, most dangerous of all, to such youth media as the Cadet Bugler at Dahlonega. Whether or not organizations which send out such material intend well, they should be immediate objectives of searching investigation by proper authorities. They constitute a most subtle and dangerous “fifth column” in America and they attack at the point where the greater susceptibility to false argument exists, amongst the youth of the schools and colleges. They are attempting to do what Hitler did with the youth of Germany, mould them to their desire while yet they are young. Most of the stuff these groups send out goes, naturally, to the waste basket. American editors are not gullible. But even though the percentage of scattered seed that takes root is small, it is nonetheless dangerous and the scattering should be halted at the source before it can do still further harm. Following graduation from North Georgia College, Jamie Connell entered active military service. Jamie Connell enlisted in the Army on March 6, 1943 . He was a first lieutenant in the U.S. Army Air Force. Lt. Jamie Connell, navigator-bombadier of New Mexico, is spending a while here [Nashville, GA] with his parents, Mr. and Mrs. A. J. Connell while on a 14 day furlough. A postcard produced from photos taken by Jamie Connell, circa 1950s. Jamie Connell served in the Army Air Force until discharged January 25, 1946. He returned to college to finish his studies at the University of Georgia’s Grady College of Journalism and Mass Communication, graduating in the class of 1948. Afterward, he went to work in journalism for the Berrien Press, of which he became part owner. Continuing his association with the military, he became a public relations officer at Moody Air Force Base. Many photographs of people and places around Berrien County that were taken by Jamie Connell have been entered into the Berrien County Historical Foundation photo collection at http://berriencountyga.com/. Some of his work found a commercial market. Jamie Connell retired from Moody Air Force Base in 1971. He died October 17, 1973 at the age of 53 and was buried at Westview Cemetery, Nashville, GA. In 1973, a University of Georgia scholarship for academic excellence was established in his name. The Jamie Connell Memorial Award is in honor of Alden Jamie Connell who graduated from the Grady College in 1948 after serving his country in World War II. His sister, Ms. Dura Connell of Macon, Ga., established this fund in memory of her brother upon his death in 1973. Jamie Connell prided himself on being a professional. He was a photographer with the U.S. Air Force and after leaving the service, became the photographer a newspaper. His love and enjoyment of photography led his sister to establish this scholarship. The school has also honored Jamie Connell with an annual photography competition bearing his name. In 2015 the family of Jamie Connell, his brother Ellis and niece Penny Connell Ray and her husband Roy Ray, established the Jamie Connell Memorial Scholarship fund, administered through the Berrien Historical Foundation. This $500 scholarship will be awarded each year to a college student with a specific interest in photo journalism. The 2015 award winner was William Luke.